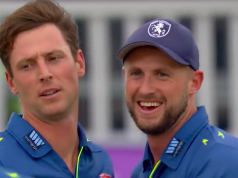 Reigning T20 blast champions Northants enjoyed their return to Edgbaston as they won by five wickets, but not without a late scare in the process. With only six required off the last over, Northants would have been disappointed to leave it to the last ball, needing only one run. But captain Rob Keogh (37*) saw his side home by striking the final ball to the boundary. Earlier, Ian Bell was in fine form during an innings of 50 (30) as together with Sam Hain (30) and William Porterfield (21), they laid a solid foundation. At 103-1 off 12 overs, Birmingham would have targeted a score close to 200. But Tabraiz Shamsi (2-24) and Graeme White (2-30) restricted the Birmingham batsmen brilliantly. White is a known danger on the county circuit and Northants have made a shrewd recruitment in Shamsi. The South African bowls a much flatter trajectory, complementing White’s more traditional bowling perfectly. Seamers Sanderson (3-0-19-0) and Gleeson (4-0-20-0) returned to restrict Birmingham in the final overs. Despite Aaron Thomason hitting 17 off the final over, the Bears only had a par score at the half way stage – finishing on 156-4. If Birmingham’s score did not already feel par at the half way stage, it certainly did after the third over. Ben Duckett has been in excellent form so far in the blast (scores of 72 and 69), but it was the turn of his opening partner to fire. Adam Rossington largely broke the back of the chase in the powerplay with powerful knock of 34 (20). As Rikki Clarke was unable to bowl due to an injury sustained whilst batting, overseas signing Colin de Grandhomme took his place by taking the new ball. However, Rossington took 24 off the kiwi’s second over to put his side in pole position. Patel’s four overs were vital to Birmingham’s chances of getting back in the game, and the off-spinner gave his side a way back into the game during a four over spell of 4-0-25-2. The Bears may regret their decision not to play a second spinner, however, as Patel lacked vital support. Josh Cobb (48 off 46) anchored his side’s chase, finding the boundary on numerous occasions. 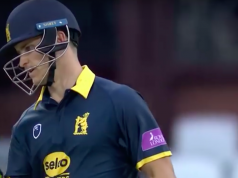 Despite giving Birmingham a sniff right at the last, captain Rob Keogh (41* off 24) saw his side home to claim a second win of the tournament and take his side to the top of the table.